Ada Township (/ˈeɪdə/) is a General Law Township within Kent County, Michigan, United States. Developed around a fur trading post of the late 18th century, the township in the 20th century became an upscale suburb of Grand Rapids. As of the 2010 census, the township population was 13,142, up from 9,882 at the 2000 census. Ada is the corporate home of Alticor and its subsidiary companies Quixtar and Amway. 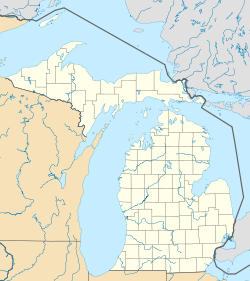 Ada also known as Ada Village, is an unincorporated community within the township on M-21, 12 miles (19 km) east of Grand Rapids. Rix Robinson built a trading post near present-day Ada in 1821 and made the first land purchase here in 1833. A post office was established in 1837. Both the township and village settlement were named for Ada Smith, the daughter of the first postmaster. It was given a station on the Detroit and Milwaukee Railroad (later part of the Detroit, Grand Haven and Milwaukee Railway). A plat was recorded in 1857. The Ada ZIP code, 49301, serves most of the township as well as much of eastern Cascade Township to the south, the northwest corner of Lowell Township to the southeast, small areas of western Vergennes Township to the east, the southwest corner of Grattan Township to the northeast, much of southern Cannon Township to the north, and a small area of eastern Grand Rapids Charter Township to the west. In addition to 49301, the Ada ZIP codes 49355, 49356, 49357 are assigned to specific organizations. The city of Grand Rapids is to the west, and the 49525 ZIP code for Grand Rapids serves a small area in the northwest corner of the township. The 49546 ZIP code for Grand Rapids serves the southwestern portion of the township. Lowell is to the east, and the 49331 ZIP code for Lowell serves a small area in the eastern part of the township. All but the northeastern corner of the township is part of the Forest Hills census-designated place, an area compiled for statistical purposes which also extends south into Cascade Township. The Ada Covered Bridge in the village, across the Thornapple River, dates to the 1860s. The township traces its history to 1821, when Rix Robinson obtained a French-Canadian trading post at the junction of the Grand and Thornapple rivers from Madeline La Framboise on behalf of John Jacob Astor's American Fur Company. Land north of the Grand River was not available for purchase by white settlers until the 1836 Treaty of Washington. There are conflicting reports concerning when the township was organized. Information provided by the township website indicates that Robinson was elected as the township's first Supervisor. However, other sources indicate it was organized on April 2, 1838, and that Sydney Smith was elected the first Supervisor and that Robinson was the second, elected in 1841 and again in 1844. A village was platted in 1858 at the mouth of the Thornapple River, but it developed slowly and never incorporated. The Ada Covered Bridge was constructed across the Thornapple in 1867. Listed on the National Register of Historic Places, it is one of nine covered bridges that remain standing in the state. According to the United States Census Bureau, the township has a total area of 37.1 square miles (96.1 km2), of which 36.0 square miles (93.3 km2) are land and 1.1 square miles (2.8 km2), or 2.90%, are water. In addition to its two rivers (the Grand and the Thornapple), numerous streams and meadows, Ada Township is known for its lush, rolling, woodland terrain. The local school district is Forest Hills Public Schools. As of the census of 2000, there were 9,882 people, 3,263 households, and 2,802 families residing in the township. The population density was 273.9 per square mile (105.8/km²). There were 3,384 housing units at an average density of 93.8 per square mile (36.2/km²). The racial makeup of the township was 95.57% White, 0.47% African American, 0.16% Native American, 2.35% Asian, 0.01% Pacific Islander, 0.51% from other races, and 0.94% from two or more races. Hispanic or Latino of any race were 1.07% of the population. There were 3,263 households out of which 47.1% had children under the age of 18 living with them, 78.7% were married couples living together, 5.4% had a female householder with no husband present, and 14.1% were non-families. 11.6% of all households were made up of individuals and 3.7% had someone living alone who was 65 years of age or older. The average household size was 3.03 and the average family size was 3.30. In the township the population was spread out with 32.6% under the age of 18, 5.4% from 18 to 24, 27.6% from 25 to 44, 27.3% from 45 to 64, and 7.1% who were 65 years of age or older. The median age was 37 years. For every 100 females, there were 99.8 males. For every 100 females age 18 and over, there were 97.1 males. The median income for a household in the township was $83,357, and the median income for a family was $87,972. Males had a median income of $61,795 versus $36,288 for females. The per capita income for the township was $37,840. About 1.1% of families and 1.9% of the population were below the poverty line, including 1.6% of those under age 18 and 2.8% of those age 65 or over. Portions of the township are served by Forest Hills Public Schools. Forest Hills Central and Eastern High Schools are located in Ada Township. The Grand Rapids Supplemental School (グランドラピッズ補習授業校 Gurando Rappizu Hoshū Jugyō Kō), a part-time Japanese school, holds its classes at Forest Hills Central High. ^ a b "Geographic Identifiers: 2010 Census Summary File 1 (G001), Ada township, Kent County, Michigan". American FactFinder. U.S. Census Bureau. Retrieved March 20, 2019. ^ "Contact Us." Forest Hills Central High School. Retrieved on April 6, 2015. "Central High School 5901 Hall Street SE Grand Rapids, MI 49546"
^ "北米の補習授業校一覧（平成25年4月15日現在）." () MEXT. Retrieved on May 5, 2014. "Forest Hills Central High School 5901 Hall St. SE, Grand Rapids, MI 49546 U.S.A."
Romig, Walter (October 1, 1986) . Michigan Place Names: The History of the Founding and the Naming of More Than Five Thousand Past and Present Michigan Communities. Great Lakes Books Series (Paperback). Detroit, Michigan: Wayne State University Press. ISBN 0-8143-1838-X. ISBN 978-0814318386. Wikivoyage has a travel guide for Ada (Michigan). Wikimedia Commons has media related to Ada Township, Michigan.